The chief executive of German carmaker Audi, Rupert Stadler, has been arrested in connection with an investigation into the diesel emissions scandal. Munich prosecutors said they had acted because of a risk that Mr Stadler might seek to suppress evidence. The scandal erupted 3 years ago, when it emerged that cars had been fitted with devices designed to cheat emissions tests. The devices were initially found in VW's cars, but its Audi subsidiary has also been embroiled in the scandal. Munich prosecutors said Mr Stadler would be questioned by Wednesday, once he had spoken to his lawyers. 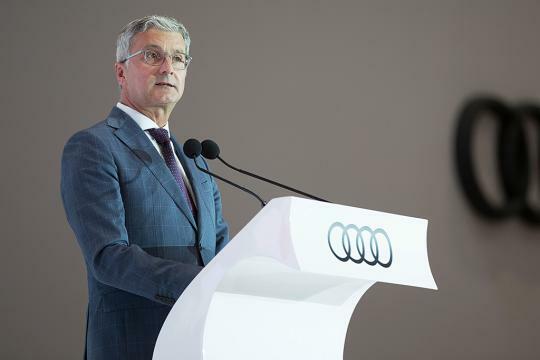 It is reported that Sueddeutsche Zeitung, VW's supervisory board has nominated Bram Schot to be the interim chief executive at Audi following the arrest of Mr Stadler.